SCG Charlotte is in the books. Grixis Shadow and Eldrazi Tron were the tournament’s clear winners, both in terms of representation and apparent power. But while everyone was distracted by that onslaught of under-costed threats, a smaller tournament was underway. Despite being won by Grixis Shadow, the Charlotte Classic yielded a few especially sweet brews, which we’ll explore today. I may have defended a Stoneforge Mystic unban last week, but I’m fine with the “no changes” announcement we received instead. Like I said in that article, Modern is in a great spot right now. I think after Grixis Shadow’s impressive performance at SCG Charlotte, Wizards wants to wait longer to see if Modern shakes itself out. Should Shadow continue putting up these kinds of Top 8 numbers, a ban might be in order, but I really don’t think that’s going to happen. Either way, if there’s anything to learn from previous unbans, it’s that Wizards always wants to be sure the format is in a safe place before making another one. This argument (in case anyone was planning on making it—ha-ha, 8 Mile‘d!) seems as old as 8 Mile itself by now, and I’m still not convinced. “Freaky decks” are the lifeblood of this format. Even Death’s Shadow was a freaky deck, until it wasn’t. Not to say any of these decks are the next Death’s Shadow—they almost certainly aren’t. But players do see these lists and pick the decks up, and then, suddenly, people are playing them. Rogue finishes in documented events do increase the format’s diversity, even if only marginally; at worst, they serve as consummate advertisements for Modern’s limitless possibility, potentially drawing new players in. But most importantly, at least for the purposes of this article: they are really fun to look at! Sol Malka clawed his way into 2nd with an updated take on The Rock, the BGx midrange deck to his name whose iterations have policed Modern with a spiky fist since the format’s humble beginnings. At a time where those usual suspects, Jund and Abzan Rock, have all but been replaced by Death’s Shadow decks, Sol’s “pure” Rock list provides a welcome blast-from-the-super-past. Lightning Bolt and Path to Exile are appealing spells, to be sure. But Bolt hasn’t broken many hearts in Modern’s most recent era. Path’s absence is the real head-scratcher here: why give up the best removal spell in Modern and Lingering Souls? Simple: Ghost Quarter. I identified Quarter as one of Modern’s top five utility cards early in the Shadow format, and with the rise of Eldrazi Tron, the card has become even more relevant (Collective Brutality and Surgical Extraction, two more of my picks, also make the cut in Sol’s list). BGx Rock decks have always struggled against big mana strategies like Eldrazi and Tron. A few mainboard copies of Quarter—especially backed up by the fourth in the side—is an elegant answer to Modern’s new darling deck, itself a mash-up of both archetypes. Quarter also becomes attractive when decks push their manabases to logical extremes, as do the Shadow decks. Once those particular strategies plant two basics on the table, it’s Strip Mine season. Graveyard hate hurts the Shadow decks, too, and Sol runs three copies of Scavenging Ooze with which to get his munch on. Ooze is a natural foil to Dredge, another proven deck in this metagame, and to Company, a favorite going into the weekend. Neglecting a splash helps sate three Oozes, as Raging Ravine and Lingering Souls aren’t around to eat up that mana. Excluding Shadow, the only Rock deck currently showing promise in Modern is Willy Edel’s Abzan Traverse, a deck that wasted no time in wooing BGx lovers trapped in the Shadow Realm (it even put another player into the Classic Top 8). Abzan Traverse is essentially a Shadow-less Abzan Shadow, preserving the deck’s graveyard-stocking dimension but skipping out on its one-mana 12/12. BG Rock borrows many elements from this dumbed-down Shadow deck, including the Baubles—but its delirium package proves far less involved. Sol runs the ancient Dark Confidant over Grim Flayer, and only plays a single Traverse the Ulvenwald in his 75! I assume the justification for these modifications is to hedge against grave hate. Shadow, Dredge, and Company were all big names going into the tournament, and ones with big targets on their heads. Sol must have tested against Rest in Peace, Nihil Spellbomb, and similar cards, and decided that while Traverse is powerful, he didn’t want to sleeve up a 75 so soft to hosers. Kalitas, Traitor of Ghet then fills out the creature suite, providing some of the late-game oomph ceded to a slimmer delirium package. Up next, we have Ali Aintrazi’s Bant Turns, easily the most scattered-looking deck in Top 8. But Ali’s success story isn’t a particularly rare one in Modern—the man just plays what he likes. In an article published just over two years ago, the brewer wrote, “I usually don’t play Modern, but when I do…I play a sweet Time Warp deck! And there’s nothing better than taking an extra turn with a planeswalker or four in play.” Keep on truckin’, Ali. Some testing with the deck reveals there’s more to it than initially meets the eye. Turns has existed in Modern since 2013, and it’s always been pretty miserable. The deck’s first iterations combined Howling Mine with Jace Beleren to chain together Time Warps until a win condition presented itself. It saw a resurgence (in as much as a deck this fringe can resurge) after the release of Journey into Nyx, which offered the more expensive but slightly less symmetrical Dictate of Kruphix (flashing Dictate in on an opponent’s end step denies them the first extra draw). Of the strategy’s glaring problems, its most obvious are a lack of speed and the unfortunate symmetry of its card advantage engines. In the most recent port of his Standard deck to Modern, Ali Aintrazi addresses both of these issues. Noble Hierarch and Utopia Sprawl jump-start Turns into its Time Walk-phase, while Jace, Vryn’s Prodigy increases early-game velocity with its looting ability. The biggest innovation here, though, is Ali’s abandonment of the situational Temporal Mastery and the double-edged Mine effects. He replaces these cards with planeswalkers, who play double-duty as incremental card advantage engines and as engine grease for the combo. Planeswalkers also act as targets for opponents and otherwise interact using their abilities, giving them even more over the deck’s previously-accepted, critical-mass-of-‘Walks core. The aforementioned Jace, Vryn’s Prodigy transforms for the mid-game into Jace, Telepath Unbound, a faux-Snapcaster Mage that flashes back Time Warp multiple times over the course of the turn-spanning combo. Similarly, Narset Transcendent‘s -2 gives Time Warp rebound while helping draw through the deck with her plus. OG ‘walker Garruk Wildspeaker and newcomer Nissa, Steward of Elements round out the planeswalker suite. The former combos with Utopia Sprawl to generate massive amounts of mana and compliments Faerie Conclave and Treetop Village in presenting a respectable clock. For her part, Nissa serves a multitude of roles—she Coiling Oracle-trips into lands, casts spells on top of the library, and smooths out draws for a whole game. Holding everything together is Courser of Kruphix, a creature that digs through the deck at worst, and boasts a number of interesting micro-synergies at best. Between Nissa, Narset, either Jace, and even Serum Visions, Courser does a good deal more here than simply act as a Narset Transcendent for lands (although that’s nice, too). And all that on a hard-to-Push, 2/4, life-netting body! Bant Turns is truly a Courser deck, in the same way that Todd Stevens’s GW Company from a few months ago was truly a Courser deck. 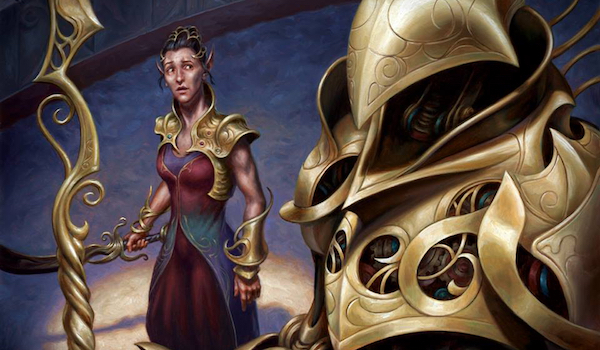 That’s right—Death’s Shadow is the best creature in Modern and we’re seeing Courser decks. Last but not least, we have John Middlebrook’s 15th-place exercise in breaking goofy Kaladesh cards. True to name, Challenge Breach uses Dubious Challenge and Through the Breach to cheat fatties into play and assumes a win from there. 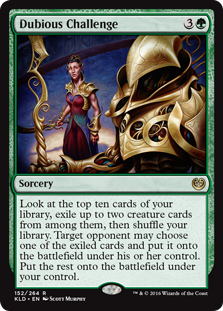 Challenge Breach is one of those decks that has me immediately excited as I first gloss over the list, and severely bored by the time I’ve finished reading it. It plays similarly to RG Valakut, which gets my vote for dullest deck in Modern: ramp up, cast Sneak Attack analog, hopefully win with ensuing boss monster—either go way over the top of fair decks and beat them, or succumb to the combo deck’s fundamental turn. This idea for a Dubious Challenge deck has actually been kicked around since last year, but John’s Classic finish marks the strategy’s first competitive outing (and enjoys a much-improved backup plan in Through the Breach). Dubious Challenge works as follows: the pilot casts Challenge, finds a fatty (preferably Emrakul, but Griselbrand or lesser options like Elesh Norn will do in a pinch) and a blinker (Flickerwisp or Glimmerpoint Stag), and passes the creatures to their opponent. That opponent chooses whether to take the fatty, which gets blinked and returns to its owner’s side of the field at the next end step, or the blinker, which presumably will blink nothing. From there, the opponent has all of one turn to win around the fatty before said fatty attacks and kills them. Through the Breach exists as a back-up plan for fatties drawn naturally, as well as something to do with all those extra Griselbrand cards. Luckily for John, “boring” does not always equal “bad.” In fact, the deck looked positively awesome when it dismantled Brad Nelson’s Grixis Shadow two games to zero on camera. The main thing Challenge Breach has going for it over Valakut is speed. With plenty of dorks, 4 Simian Spirit Guide, and four quasi-win conditions that cost only four mana, the deck is capable of very consistent turn three combos and some turn two combos. Challenge Breach pays for this speed increase by trading away Valakut’s inevitability—given a few turns, the Primeval Titan deck will kill you, even if it does so by simply ramping into Lightning Bolts (er, Mountains). Conversely, Challenge Breach can be crippled in a number of ways (most effectively via Stubborn Denial or Grafdigger’s Cage, but can we please print Containment Priest for Modern already), and it doesn’t exactly get to play a fair game in the meantime (depending on how you view paying 2WW for a 3/3 vigilance). Novel decks popping up and experiencing ephemeral success is standard fare in Modern, and it’s nice to know that tradition isn’t going the way of the dodo in the Death’s Shadow-Eldrazi Tron metagame. Here’s to hoping GP Las Vegas brings us more cool brews, and please post any I may have missed in the comments.